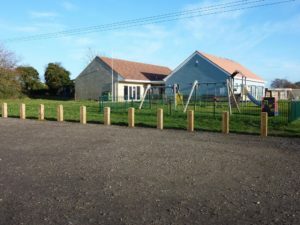 KJ Architects were invited to attend a limited selection process for the selection of an architect to build a new village hall by the Kentford & Kennett Village Hall & MacLaren Playing Field Association. KJ Architects were selected to act on their behalf in mid 2015 and proceeded to prepare designs that would not only meet the brief and budget but also establish the rightful location for such an important community facility. When choosing the preferred site for this development, there were three distinct areas within the village that were considered: Kennett North, Kennett Central including the Banks Cargill Agriculture Ltd site and Kennett South including the Hanson Aggregates site. All of these sites would have required the installation of a sufficient electrical power supply and an integrated soiled water disposal system which would add considerable cost to the project. The three areas investigated were soon discarded for various reasons including contamination of the land or that parcels of land were privately owned or were not large enough to house the new facility plus car parking and access. It was established that Kennett was very restricted for suitable sites for the Community Facility. The chosen site adjacent to the Kennett Sports Pavilion makes good use of land, which is already owned by the Kentford & Kennett Village Hall & MacLaren Playing Field Association and indeed an exception to build outside of settlement boundaries must have been granted when the Sports Pavilion was built. 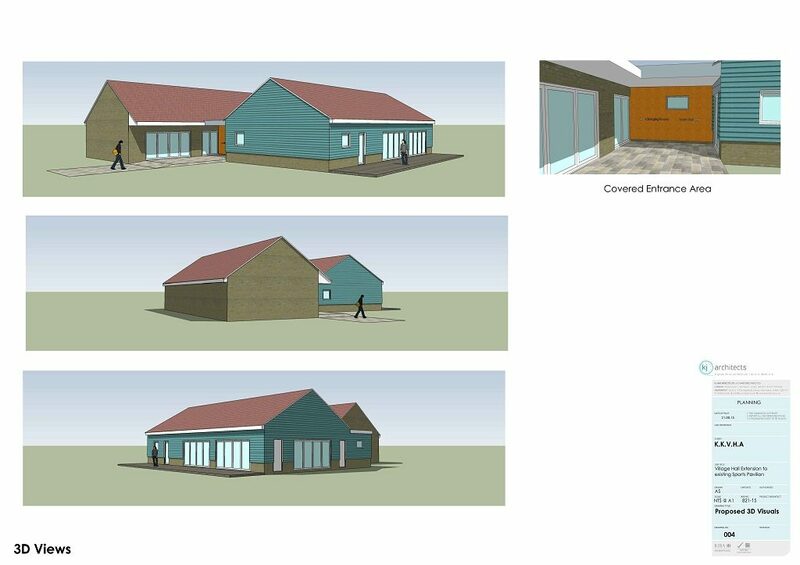 The proposal simply provides an adjoining new building to that existing facility, maximising the space available, the existing car park, the electrical power supply, soil water disposal systems, playground and sports field facilities which would become available to users of the Village hall. 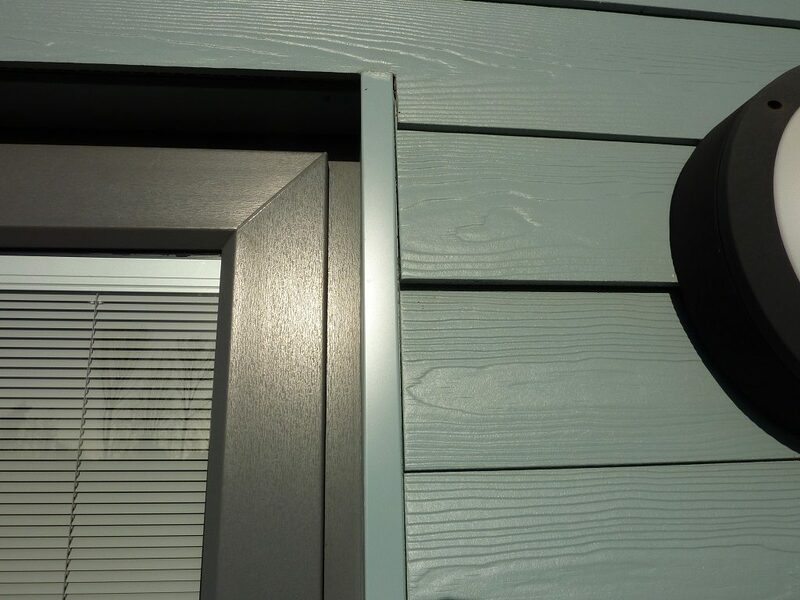 This solution would maximise the value of the funds available for this project and integrate the facilities that will be available to both the residents of both Kentford and Kennett. The proposal sought to provide a 180sqm new building to the existing sports pavilion, to comprise of a new village hall with Main Hall with space for a demountable stage and capacity of 100 people. As well as kitchen facilities, changing area for performances, toilets and storage rooms. 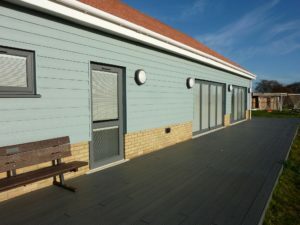 The existing building is a community sports pavilion which enjoyed the use of sports grounds for the use of local residents of Kentford and Kennett. 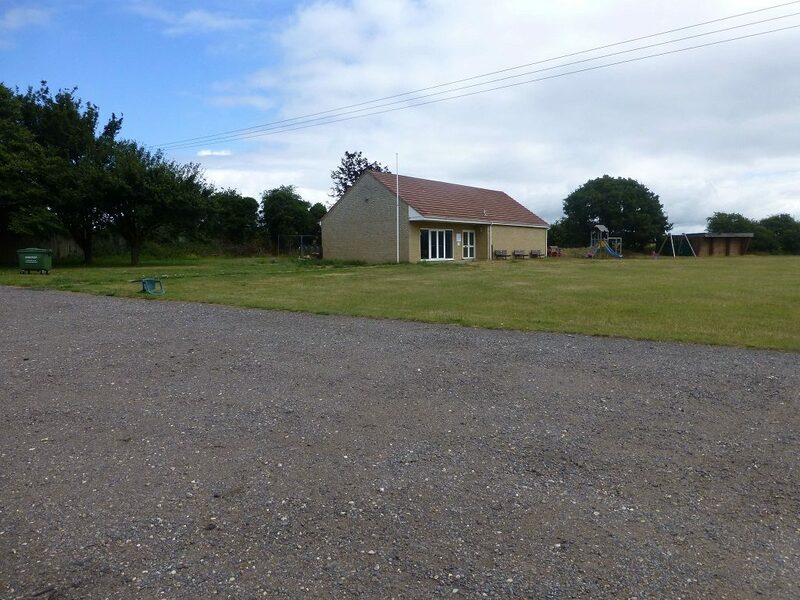 The new hall had to be independent but was physically linked to the existing sports pavilion. 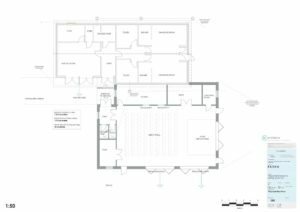 KJ Architects sought to engage with the HRMC VAT office to agree that the building, whilst adjoining, did not share any of the existing facilities and was not linked to the existing in any way. This was a long drawn out process which resulted in an agreement that the new pavilion would be zero rated for VAT purposes saving many thousands of pounds. 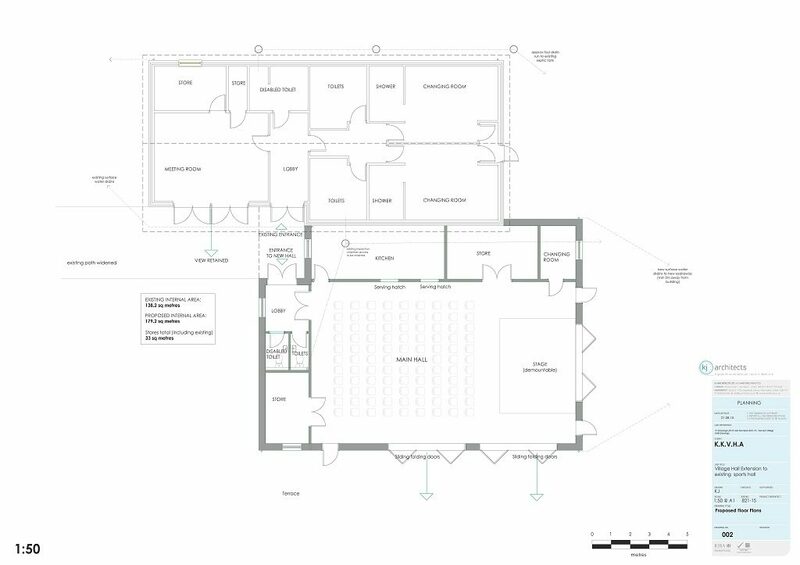 The existing changing room/ meeting room block was not altered at all as part of the proposals. 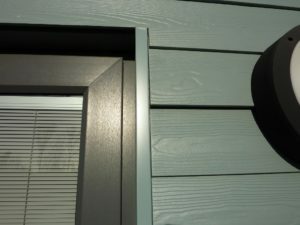 The new building has its own entrance, opposite the existing building entrance and as part of the works a covered porch area was provided as a link for the two buildings. 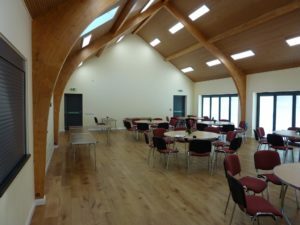 The building contained an acoustic ceiling which has been praised by all that use the hall, and water bourne underfloor heating driven by an air source heat pump. An external decking area was installed as part of the works as a viewing area to the playing fields. The car park layout was retained as existing. 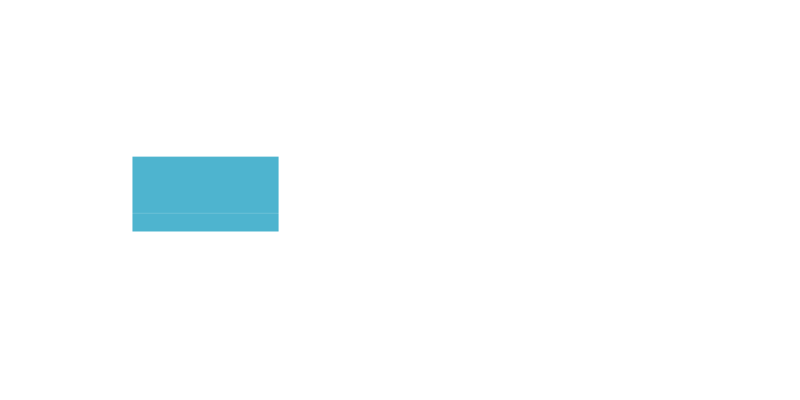 The overall scale of the proposed building was in keeping with the existing building. The highest point of the ridge being only 415mm higher than the existing sports pavilion, to keep the gable pitches on the elevation facing Station Road consistent. The existing sports area was retained as existing with the exception of a new training area to be allocated in view of the new extension. The existing tree belt around the site was retained, and no trees were affected. The existing access/ exit was retained off Station Road and is used as the main entrance. Level access was provided to both entrances to the new Main Hall and the existing sports changing facilities/ meeting room by careful detailing of paved areas. It had been noted that it would be preferable to have the proposed development follow the linear form of the existing building because the bulk of the development will be visible from the entrance and could be considered detrimental to the rural character. We feel we have reached a design which is both in-keeping with the original Sports Pavilion and provides a pleasing elevation when viewed from the main vehicular entrance. The building was completed on programme on the 30th November 2017, and on budget, by Godfrey and Hicks, a local Contractor, who won the contract on competitive tender. KJ Architects were appointed as architect and Contracts Administrator on a full service commission and worked closely with the building sub-committee and project manager appointed by the Kentford & Kennett Village Hall & MacLaren Playing Field Association. 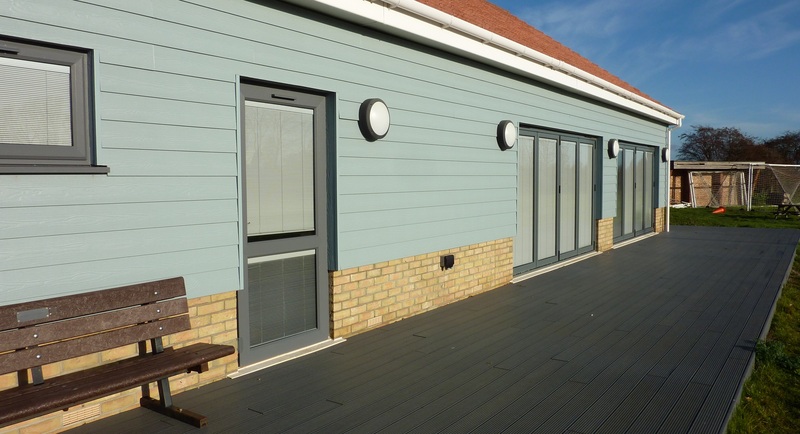 We have recently carried out the 12 months defects liability inspection where only two minor defects were identified, a loose drawer front and a small twist in one plank of the external boarding which bears testament to the capabilities of the contractor.